Open up the Ram ProMaster van that Matt Cullens spent months converting into a camper and you'll find a full-sized bed, table space, chairs and a kitchen stocked with cooking equipment. 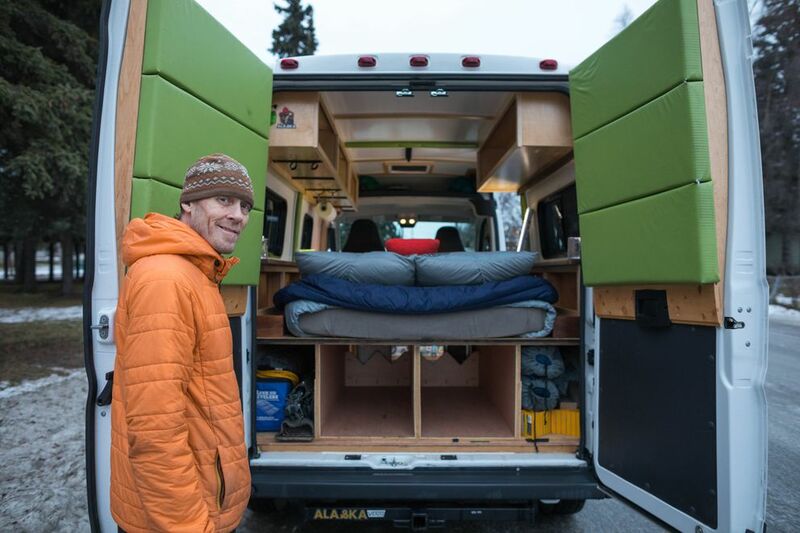 His company, AlaskaVans, rents out the van during the summer to people eager for an alternative mode of transportation — somewhere between more rugged tent camping and bulkier RVs — to explore Alaska. "The RV rental places sell out and this is more of a niche with people who aren't looking for the big honking RV," said Cullens, who used to work in the hotel industry. "When I first saw them, I thought, 'That's what I'd rather have.' It seemed like the simpler and lower-impact version of a camper." AlaskaVans is one of a few businesses that have cropped up in Anchorage this year and last, offering a compact way of touring. Chasing the social media popularity of tricked-out buses and vans that allow you to haul your bed and life to the forest or beach, entrepreneurs see a market in Alaska for tourists and local explorers alike. Cullens rented the van out for about 50 of 100 days it was available this past summer — it costs between $170 and $235 per day, depending on when and how long you rent it for — and he's working on converting a second van now. Scroll through the hashtag #vanlife across social media platforms and you'll find a stream of images showing Volkswagen Vanagons, Mercedes-Benz Sprinters and the like redesigned to camp or live in, some complete with hung tapestries, wood interiors and televisions. Wendy Wagner, who helps with her partner Jon Davis' Anchorage company Alaska Camper Van Rentals, said vans converted to complete living spaces have become extremely popular in the Lower 48, "especially if you drive down Highway 1" in California. "It's just taken folks a while to bring that culture to Alaska," Wagner said. "I think it's going to keep thriving." Alaska Camper Van Rentals has a small fleet it rents out in the summer months, and this was its second year in operation. Most of their vans have two beds and also come with a refrigerator, linens and more. Wagner and Davis got the idea to launch the business after traveling around in a Sprinter themselves. "We were doing our adventures and people said, 'We want to do this with our family,' " Wagner said. "So I thought, 'Maybe we'll get one more van and try it out.' "
Mandy Morell decided start a camper van rental business while she was living abroad and drove a Volkswagen van around Portugal. She came back to Alaska in August and decided to launch her own company called Trickster Trips. It's planned to operate in a coming development in South Anchorage. She has a fleet of three Volkswagen vans named Goldy, after the gold rush, Poly, after Denali National Park's Polychrome Pass, and Sue, for Mount Susitna. Morell likens the compact van lifestyle to the tiny house craze that has spread across the country, including Alaska, in recent years. She also wants to tap into what she sees as a kind of restlessness among millennials and some Generation X-ers. "They change jobs so many times, they're not sure what they want to do. They have all this wanderlust because they have access to so much knowledge on the internet," said Morrell, who is 38. "This idea of being mobile — with the internet, people can do that on the road." Some have renovated their own vans or buses to travel around the state and Outside for longer stretches. Anchorage couple Dillon Vought, 31, and Tessa Ely, 29, bought a Volkswagen Westfalia van for $500 a few years ago. They rebuilt it and then drove it to the end of the world — Tierra del Fuego, the southernmost part of South America — and around North America. The bus was their main residence for about two years. "I think there are people who want adventure, and people who are doing it for economic reasons," Ely said. She thinks living in a homey van appeals to millennials because so many have burdensome student loans that make a vehicle more attainable than an actual house, and because "it's just become so romanticized." They've finished their South America trip and recently bought another van, but now they're looking to put down roots. "I'd like to say we're forever wanderlust people, but we're definitely ready for a home, and do the van life as more of a weekend or couple-months-at-a-time sort of lifestyle," she said. "It's not glamorous. We were eating Top Ramen and finding cheap ways to do it." Some van-dwellers build up big enough followings on Instagram — where they post internet-perfect photos of mattress-lounging in the back of a van pulled up to a scenic vista, or Volkswagen interiors complete with wood cabinets, cozy rugs and string lights — that they're able to monetize the lifestyle. Cullens said his clientele runs the gamut from Americans to international travelers, from 26-year-olds to people in their 60s, generally all the adventurous type who might not be into the cruise scene or traveling by train. "It's definitely camping," he said. "I'd never be able to convince an RV camper that they'll love my thing because they won't. It doesn't have the amenities, the VCR … My kitchen is a camp stove, but it has everything you could ever need to cook off." 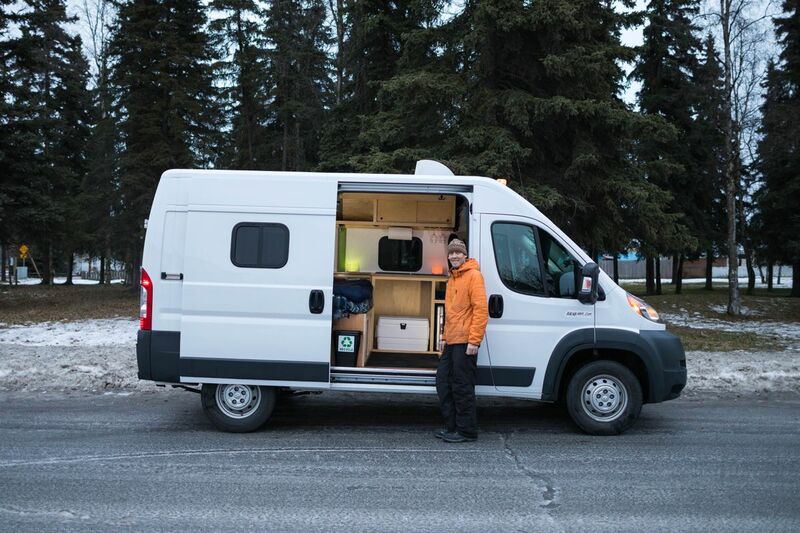 The companies mainly operate in the summer, so renting out vans is hardly a full-time gig for the Anchorage entrepreneurs. "This is sort of a passion of ours that we want to extend to other people," said Wagner. "It's brought us a lot of joy to bring people a unique Alaska experience in a camper van."